I just hope that Afro is as good as it looks in the picture. That’s an awesome freebie. The fro is really nice & it's < 700 complexity. I’ll definitely give it a try later today. I’ve been looking for a good Afro for about a week. 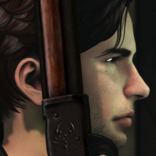 It bothers me somewhat that all the avatars are just regular humans. SL has so much more room for creativity, and a huge part of the population don't even use human avatars. Why not have a robot, a furry, a flying toaster...? Edit: Like, the man carrying the dog is cute, but if it was the dog carrying the man it'd be a thousand times more memorable. Is it just me, just the Firestorm viewer or a glitch? 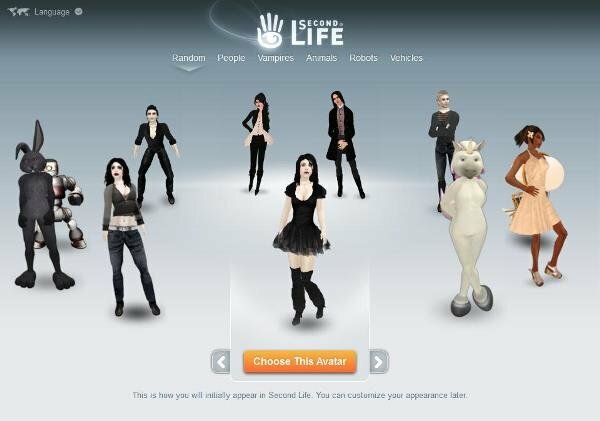 I cannot wear anything from the last 3 gens of avatars, I remember when the ones with the horses came out I was excited to try just the horses, but no dice, nothing I tried worked. At the time I just figured those avatars and their accessories were blocked to new users only, I figured that was LL doing since they wouldn't wanna be offering a free ride-able horse (also the wings and other props) and directly competing with some offers on the market. More on topic I do like these avatars even if some people will complain they make SL look like The Sims. 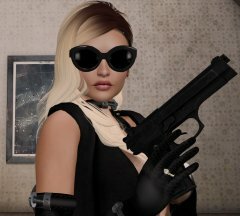 The truth is most objects for sale on SL, and more importantly free gifts, are made for humanoid avatars, having something like the werewolf (or the other full mesh avatars) is only a hinder to new users. You literally have to tell them to take it all off and start building an avatar from the ground up and as someone that has helped dozens of people get a foothold on SL that is something that will literally make people quit in frustration. One thing I wish LL would do is make the clothes on these avatars more modular, I'm willing to bet for example the 70's rocker dude has the jeans and shirt as one object, possibly the shoes too. While I'm wondering I'm also curious, are the skins on these 1024x1024 in preparation for bakes on mesh or are they still using the old 512x512 on the default avatars? At the time I just figured those avatars and their accessories were blocked to new﻿ users﻿ only, I figured that was LL doing since they wouldn't wanna be offering a free ride-able horse (also the wings and other props) and directly competing with some offers on the market. 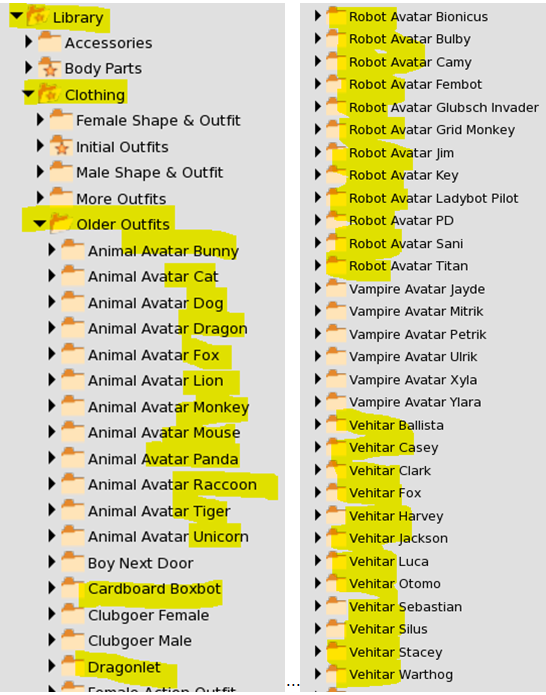 No it's just borked up... you can access them by picking one form Avatar>Choose an avatar that way they get copied to a subdirectory in your "clothing" system folder. Seems like a lot of trouble for no good reason to me. Still waiting for the last name option to return as promised a year ago. These are pretty good but they are still super-tall. Shh, don't tell Penny Patton. Fortunately the shapes are mod so that (and the huge hands) are easy to fix. Skins are meh; the faces are good but the rest of the body looks like someone forgot to finish them. Clothes and hair are pretty decent, but there's no redheads this time. Lots of newbies make "walking around naked" the very first thing they do. I don't spend money outfitting most of my alts. They don't have their own SLife, but exist for my land group only. Thus I like it when LL gives us a new set of starter avs. What I don't understand is the lack of diversity in these avi..most of them are What I don't understand is the lack of diversity in these avi..most of them are Caucasian with a few crazy looking brown ones thrown in there and hardly any other races represented..there are more fantasy avi there than human diversity..this is 2019,right?